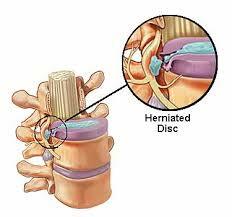 Disc herniation occurs when the soft cushion that sits between each vertebra is pushed out of position. Pain develops as the spinal nerves, at the top of the spinal discs, are exposed, causing irritation and tenderness. Disc herniation causes a number of painful symptoms such as nerve pressure, numbness, tingling, shooting pain, difficulty standing.